A potential loan or permanent move to the Serie A club in August fell through but the Turin outfit are reportedly set to come back for the Croatian when the transfer window opens in January. He said: "I think they have probably seen how well he's been doing. "He's only a boy really at 22 years of age and developing very, very well. "He's got all the attributes and still has improvements to make of course, but if you're a top club you would want someone like him. "But he's very much a part of what we're building here." 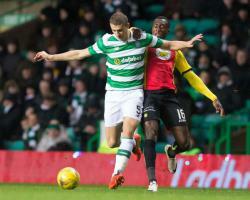 Celtic extended their unbeaten domestic run to 21 games but were far from their best against a side they had beaten 4-1 at Firhill over a week ago, albeit with Rodgers making eight changes from the side that started the 2-1 win over Dundee at the weekend and giving 18-year-old Calvin Miller his debut at left-back. Jags assistant manager Scott Paterson was frustrated by the chances the visitors missed but insists all is not lost. I know you look at the table and we sit bottom of the league.